Hey there Noodles. Glen here once again with an update on all things Cake, and all things Sue & Glen Nelson. It's been a while since the last official update, so instead of a summer kickoff, let's try an end-of-summer wrap-up. 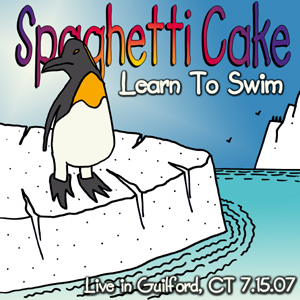 To fill you in completely, I have to start with last summer, where Spaghetti Cake played a run of great shows including an unforgettable concert on the Guilford town green, which resulted in our first ever official live bootleg, "Learn To Swim". We made only 150 copies, and distributed it off of our MySpace and official site for free, while supplies lasted. I'm glad to say that we shipped copies from coast to coast, and even a few overseas. Many thanks to our own Christopher Eddy for all the hard work on that project. Summer 2007 also saw the release of a brand-new studio EP, "What About Pluto", which was released on September 4th, 2007 as an iTunes only digital exclusive. It contained 2 studio tracks from the band, recorded at Monster Lab Studios in New Britain, CT and mixed by our old friend Earl Cohen. Also included was the now classic but unreleased "Farm Boy", as well as a new Spaghetti Cake original, "Miles & Miles Of Smiles", which was commissioned to be included on a national dental health CD, and recorded by Mike Shirra of Share-A-Voice Productions. If you haven't downloaded your copy yet, get over to iTunes right away! Once school started back up, I spent most of my waning free time promoting the "What About Pluto" EP, (and created MySpace Music site #4, for my old high school band Via Satellite) and Sue became ever more prosperous and successful with her real estate company The Oliver Nelson Group, with her partner Ed Oliver. In the last few years, for anyone who doesn't already know, Sue has really managed to transform herself into a mini-mogul in the real estate world, particularly in the field of investment in large apartment complexes. mostly in the South. While that job does keep her very busy, it also makes her very happy. And like anything that Sue puts her time and talent into, she is very hardworking and very good at what she does. At the time that Aidan was born, we also got a nanny to help Sue out around the house, Judith Evans, and she has been living with us for a year and a half, and has managed to fit in very well, and we really enjoy having her around. At Polk School, around April 2008 we released our 7th consecutive music CD, "Polk School Party", a collection of the greatest dance hits of all time. We sold an amazing 250 copies (sold out!) and raised $1,000 to go towards the purchase of 30 new baritone ukuleles for our school. It was once again produced by our dear friend Mike Shirra of Share-A-Voice Productions, and featured some amazing solos from my 3rd, 4th, and 5th grade students, including a career-topping elementary school vocal performance from one of our favorite young stars, Teairra Maunel, who has performed with Spaghetti Cake on many occasions. It also featured a brand-new Todd & Glen composition called "The Ballad Of Indiana". Todd "E-Bones" & I wrote this song not only as a follow-up to "Farm Boy", but also in honor of the impending release of the fourth Indiana Jones movie in May 2008. Like "Farm Boy" before it, this song had its world-premiere debut on the "Indy-Cast" with Ed Dolista, and was also played on the "MacCast", as well as coverage on iBerkshire.com and even on NPR! Todd & I felt that this song more than any other we've written, really harkened back to the days of our childhood, when we were in each other's first band called "High Adventure". 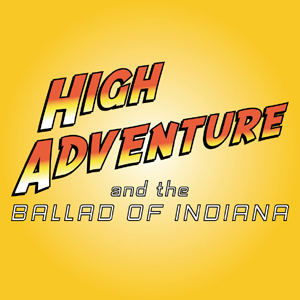 So, we made up a new website High Adventure Music, where listeners can download a high-quality version of the track for free, as well as my fifth (and final) MySpace Music site for High Adventure . So sign up and be a friend today, there will be more new music from us soon! In other Polk School news, in addition to our usual concerts, 5th grade podcasts, and school-wide talent show, the final feather in the cap for the students & I was when Ed Dolista of the "Indy-Cast" played our 4th grade chorus performing "The Ballad Of Indiana" on the show! This summer, I had the thrill of playing on the mainstage at Max Creek's Camp Creek music festival with my longtime bandmates in Flipper Dave, which included Brett, myself, Steve, and Mike, and was one of most unforgettable Flipper shows in our band's history. The crowd was huge! It was such a blast. Flipper Dave continues to be a jam rock powerhouse everywhere that we play, and the gigs are always a very special experience for both us and our loyal fans. 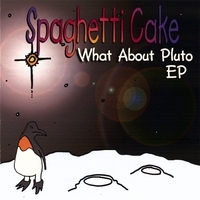 Spaghetti Cake also had the great honor of hitting the mainstage at both Strange-Creek and Wormtown music festivals in 2008. 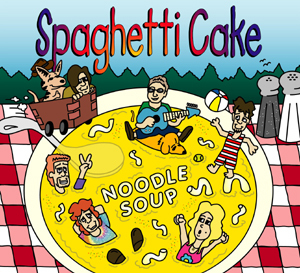 Spaghetti Cake also played numerous other indoor and outdoor concert venues, many of which featured a familiar face on drums, "Flipper" Steve Battistoni. So, we managed to keep very busy, and it looks like we're movin' on up! I also continue to remain active with my other part-time job, which is as pianist and organist for Immaculate Heart of Mary Church right here in Harwinton, CT. That has really been a lot of fun for me on so many levels, not just working with the other great musicians, but also with the kids chorus as well. This Fall I am entering the RCIA class, where I will be taught the Christian faith and ultimately be baptized and take first communion on Holy Saturday next March, right before Easter Sunday. I am looking forward to taking that exciting new journey! In other musical news, I spent my summer this year working with an amazingly talented singer/songwriter and musician named Mike Greca. We spent the summer rehearsing and working up the arrangements for his songs and then we went into the studio and recorded the whole thing LIVE in front of an audience! It was recorded at our own Mike Tierney's brand-new recording studio Audio Media Solutions (formerly The Gallery - which now proudly houses my GOFF Professional Hammond B3) and in doing so I got to work with some amazing local artists, and incredibly talented people. It was a lot of work, and an unusual way to record an album, but it turned out to be an unforgettable experience, and one that I will never forget. Mike Greca is a superb local artist, and I can't wait for the album to come out this Fall! Sue & I also got to take in some great concerts in 2008, way too many to remember, but the ones that stand out in recent memory would be Jackson Browne solo acoustic at The Oakdale, Brian Wilson at The Warner Theatre, Rush and Jethro Tull at The Mohegan Sun, Neil Diamond at the Civic Center, and coming up this Fall, Zappa Plays Zappa! Also, I continued to listen to so much great music in 2008, stay tuned for all of the highlights in this year's Nelly Awards in a future blog post. The album of the summer? The soundtrack to "Star Wars: Clone Wars". Glen again, with your June 2007 Noodle News Update! I've been blogging on MySpace all year long, if you're a regular reader of this blog. 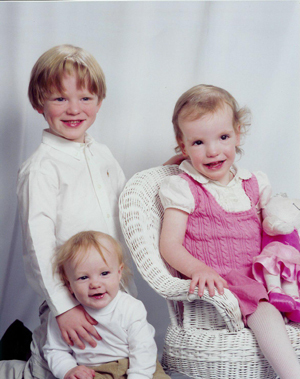 (all 3 of you) That said, could you do me a HUGE favor if you're reading this blog right now? Would you please, please subscribe to the MySpace blog? I'd really love to know who's reading. (thx!) Anyway, in addition, for all of you original Cake site "Noodle News" readers (I know you're out there!) thank you as always for reading, and P.S. no hyperlinks this year to all the fun stuff - it's all there for the taking on either the original Spaghetti Cake website HERE, the official Mr. Nelson Polk School website HERE, or the one and only Spaghetti Cake MySpace Music page HERE. Many thanks. So the BIG news: Aidan Edward Nelson, our son and third child, was born on March 20th, 2007, just three days after St. Paddy's Day. He is so cute and looks so much like me and Foxy. The night before Aidan was born, we asked Fox what he wanted the baby to be (it was going to be a surprise) and he said, (being into Star Wars), "a trooper!" Well, Fox, you got exactly what you wished for. A gorgeous little clone. In other huge band news, "Ready For Summer" was released on DVD and is readlily available for purchase everywhere. We in the band are very proud of the film, a beautiful recreation of a magical summer's eve in Watertown, CT on June 21st, 2006. We very recently returned from our year-after-to-the-day June 20th, 2007 repeat performance at Veteran's Park, and it was a sheer joy and rewarding triumph. New songs were many, including the teen-angst fueled epic anthem penned by Eddy and Nelson titled "Bad Influence". On the flip side, Glen inked an epic anthem with his children's chorus in church. (Glen serves on the music ministry at the Immaculate Heart of Mary Church in hometown Harwinton, CT.) "Happy Birthday, Jesus" was premiered to a standing-room only crowd at the 5:00 mass on Christmas Eve. Todd & Glen's ever-growing pop hit (and tribute to Star Wars) "Farm Boy" continued to gain in popularity, as it was played on the official Star Wars Podcast "The Force-Cast" TWICE, and also became available for the very first time as a Cingular© Ringtone! We'd surely thank you if you bought it for your mobile! 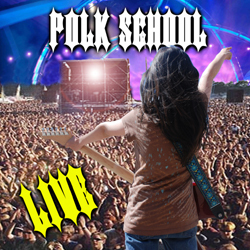 And of course, the past year included the release of the SIXTH consecutive Polk School music CD, "Polk School LIVE", a collection of 20 new original compositions by Glen and his regular classroom music students. The album was written over the entire school year, yet performed (and recorded) in a single afternoon on April 12th, 2007. It sold 160 copies and helped raise over $400 for the Polk School music program. Also this year my fifth graders recorded their end-of-the-year live podcasts, which are available on the Polk School site as a free download. Also available on all sites are my latest two Spaghetti Cake podcasts, with me singing all of the new material written over the past year. Feel free to download, listen and enjoy. Musically, this year I was inspired by MANY artists, yet the genre that seemed to hynotize me the most was North American Celtic Rock. As any of my close friends know, I spent an inordinate amount of time listening to the Virginian band "Carbon Leaf", and even took in a show here and there. A superb band, all the way. If I could snap my fingers and make one band famous (other than ours) it would be these guys. Similarly, I was very inspired musically this year by a band called "Great Big Sea", from Newfoundland, Nova Scotia. They really know how to tear it up in a more traditional, yet modern Celtic pop sytle. Other bands or artists that got to me would be (in no particular order) Train, Brandi Carlile, The Weepies, Mary Chapin Carpenter, Colin Hay, Michael Penn, and The Town Pants. I dug several great newly-discovered MySpace bands like Tripsitter, Candypants, Anchorhead, Big Organ Trio, The Miles Of Smiles Show from North Ireland, One Ring Zero, and Pear. The other big story of course, was the creation of not one, but THREE way-cool MySpace Music pages. And as I write this, we are yet again on the verge of our annual trip up to Blue Hill, ME, where we recorded our first 2 albums, and even wrote our hit "Farm Boy". It is a magical place to relax, and renew, and contemplate the next step in life's journey. 6.24.2006 Happy Summer, everyone! School is out, change is in the air, and it appears that it is time once again for a Noodle News update. This update finds Sue, Fox, Vayle & myself on the cusp of a very important move in our lives. We are going to live in Nashville, TN for the entire summer! Why Nashville? Well, as many of you know, it has been a dream of ours since even before we started Spaghetti Cake to live, work, and write songs in the most exciting musical city on the face of the Earth. What makes this move at this point in our lives intriguing is that over the past year and a half, while Sue has rasied the babies, she also got her Realtor's Liscence, and has already made enough deals to purchase an apartment building in downtown Nashville. We will live rent-free for the summer (or anytime we want to go down there and visit.) That's pretty exciting, huh? Don't worry, however, we are planning on coming back in late August. Hey, we have Spaghetti Cake shows to play - we have no choice! Speaking of Spaghetti Cake, we have had a great year since the last update. Todd-e-Bones and I have written a new song, "West Hill Road" and I produced our first official podcast. We just finished filming our very first live DVD this past week at Veteran's Memorial Park in Watertown, CT. Thanks to Reflection Productions for doing such an amazing job shooting the movie. The DVD will be released in Fall 2006. We will spend the summer editing the project and making it look incredible, stay tuned. In September 2005 we welcomed lifelong friend Christopher Eddy into the band as our full-time percussionist. It has been a pleasure to have his talent and musical spirit (not to mention vocal ability) added to the mix. In addition, this past year we officially welcomed sound and light technician Mike Ladeau of Outhouse Sound to Team Spaghetti Cake. We played some amazing school gigs with the band this year, including the River Street School in Windsor, CT, the Early Childhood Center in Plainfield, CT, and the Girl Scouts of Connecticut's Annual Gala Ball at the CT Grand Hotel in Waterbury, CT. 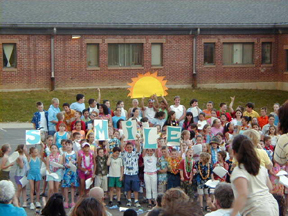 I also taught another run of hugely successful afterschool songwriting workshops in Roxbury, CT. Click here to listen to the results of the March 2006 K-2 group, "Let Life Move You". Spaghetti Cake also played numerous other outdoor shows and festivals, and we have a number of exciting shows to look forward to, including Moe.Down 7 in September with the legendary jam rock band Moe! In other band-related news, our original bass player from both CDs Jo & Lisa Horsley got married in September on a beautiful wedding weekend in Cape Cod, I started playing organ and piano regularly at the Immaculate Heart of Mary Church here in Harwinton, CT after the New Year, and Sue & I got to see Sir Paul McCartney perform at MSG in NYC in the 15th row (center), what a dream come true! Happy 64th, Paul! I got a chance to talk to both Al Jardine and Brian Wilson from The Beach Boys (click to listen) and Christopher, TEBs, and I also got together to record our musical tribute to the boys of summer with "Our Prayer". In Polk School news, we completed work on our 5th full-length CD of songs that the classes themselves voted on and performed, titled "Polk School Rocks". This project raised $1,450 for Hurricane Katrina relief that we donated to the Salvation Army. Another huge accomplishment at school this year was the realization of a series of 5th Grade Podcasts. Check 'em out - they were all done live with my students right in our music classroom! It was a great way to end the school year. I was also honored at school this year for my commitment to excellence in education, which was very special. My other band Flipper Dave continued to perform this past year, I sat in with numerous other bands on keyboards, including The Reverend Tor Band, Shakedown, Duke & The Esoterics, The Bantam Phantoms, The Mark Paradis Band, even my old high-school band Via Satellite got back together for a couple of fun-filled jam sessions, and I did my first ever solo gig at this year's Strange-Creek Festival! In family news, Bodhi turned 7 this year, Foxy is 2 and a half, and Vayle turned 1. She is a beautiful little girl, who is always improving. This summer I will turn 35, and we are on our way to Nashville, TN. Our dreams are coming true! Wish us luck and we'll see you all in Westport, CT on August 23rd. 6.21.2005 It is the eve once again of summer vacation, and therefore time again for a Noodle News update. A lot has happened in a year in the life of Spaghetti Cake, and here's a quick recap; The exciting news is that as of this writing we are NOT heading up to Blue Hill, Maine, beacuse we just brought home our beautiful new baby daughter Vayle Ottavia Nelson, who is just over 7 weeks old. Vayle was born on April 30th, 2005, on a Saturday morning at 2:31 am. (Incidentally, Fox is 20 months old today and doing wonderfully!) Vayle was hospitalized at Uconn Health Center for 6 weeks, and gave us a pretty good scare, but the miracle baby is home now, and in great health. Thank you to everyone who prayed for Vayle with us, we appreciate everything you've done. So if last year was a year for starting things, it seemed this past year was a year for finishing things. I finished my sixth-year degree in educational administration on time in December 2004 and graduated from Sacred Heart University. (No word yet on on when I'll be a principal - but I'm looking around for fun anyway!) We finished our major re-construction project on the 2nd floor of our house, which is now a joy to actually live in! Todd-E-Bones (who officially joined the band this past year) and I, as promised, did go up to Blue Hill last June and wrote the first of many new songs to come, called "Farm Boy". We recorded it at his house in August and finally got to perform it live with the band in April. See if you can figure out what the lyrics in the song are about! As you can see from the album cover photo below, in the Fall I finished an 18-track CD with my students at Polk School called Buckingham Street (a takeoff on The Beatles "Abbey Road" album cover.) The kids and I wrote and performed all original words and music for the disc, and it was truly a cornerstone in my career as a music teacher. In the Spring, we also did an outdoor concert that celebrated the music of Brian Wilson & The Beach Boys, and it was truly a blast (see above photo). Check out his wonderful new CD entitled "SMiLE", I loved it! Through it all, the band continued to rock our usual line-up of outdoor shows and festivals, as well as a number of public school performances such as Booth Hill Elementary School in Shelton, CT, and an encore engagement at Washington Primary School. Thanks as always to the continued assistance of the Conneciticut Commission on the Arts, whose grants help to fund our touring fees. Check out our concerts page for all of the upcoming shows this summer, including a return to the Wormtown Festival in Heath, Massachusetts this September. I also ran an afterschool songwriting workshop in Washington Depot with some very talented young songwriters, who performed their song live onstage with the band! To hear what we ended up with, check out their original composition entitled "The Combination". I will be returning to write and compose again with the ASAP program this summer. In other news, we regretfully had to close the official Spaghetti Cake online store, but our two CDs, Jam Food and Sunflower are now being distributed by an online company called CD Baby, which also handles the Flipper Dave CD, Something Simple as well. Our other merchandise such as stickers and t-shirts will still be available for sale at all of our live shows. This past year we also welcomed back an old friend on drums, Mike Tierney (Yes, we have two drummers named Mike), and we welcomed vocalist and dear friend Pamela Rivera to the band (whose voice you might recognize on "Bedtime Story"). My adult rock band Flipper Dave celebrated its 10-Year Anniversary Show at KC Dubliner, and yes, Star Wars Episode III was finally released, and it's great. By the way, Bodhi turned six this year and she still loves the ball as much as ever. So will we ever get up to Toddy Pond this summer? I definitely think so. I know we've earned a little R&R. This summer we may actually have a chance to get some. We'll see. As usual, we look forward to playing for our fans at our live shows, and writing more exciting new material for the band to play and record. Stay tuned, noodles! See you this summer. 6.20.2004 Another year has gone by (or is it two?) and again tomorrow I head up to beautiful Blue Hill, Maine with my family, so the time has come once again for an update. In June 2003, Spaghetti Cake become members of the Connecticut Commission on the Arts, which is a wonderful opportunity to receive state grant money to help fund our performances in schools, park & recs, and any other non-profit shows that the band plays. We have had a great working relationship with the organization so far, and hope that we continue working together for many years to come. Sue & I left our beloved residence in Morris, CT where the first two Spaghetti Cake CDs were written, bought a house of our own in Harwinton, CT and moved in September of 2003. 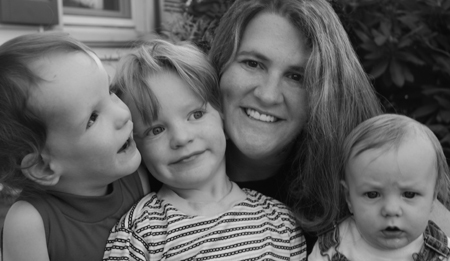 We welcomed the arrival of our darling son, Fox Alan Nelson on October 21, 2003. (see link) Fox arrived and the months flew by. He is, as of this writing, 8 months old already and he is beautiful! There was no shortage of performances, of course, we performed at public school assemblies from Milford, CT to Washington Depot, CT, and had a rocking good time! Sue & I did a great afterschool songwriting workshop for the ASAP program in Roxbury, CT (see below), which we will be returning to in the Fall for an extended stay and an even more in-depth program. This summer we will be returning to some of our favorite places, as well as adding a few new shows, including for the very first time, Camp Creek 2004, a very cool music festival in upstate NY, with Rob Fried's band of 32 years, Max Creek. In June 2003, Sue finished her Master's Degree in Arts & Learning from Sacred Heart University, and now I myself am more than halfway through with my own graduate program of study at SHU as well. I have been studying for my sixth-year degree, which when I finish in December, will allow me to be a principal or a superintendent in the state of CT! Cool, huh? Can you noodles imagine Glen from Spaghetti Cake being your principal? No plans for that just yet, as I am still a music teacher and I love it 100%. We have also been improving our new house, big time, and have spent what little free time we have on the weekends rebuilding the 2nd floor of our house with Sue's Dad, which hopefully should be completed in a few weeks, and will be so amazing! I also became a band teacher at school this year for the first time, so I have had a lot of fun with my new Polk School band doing the parades and the concerts. 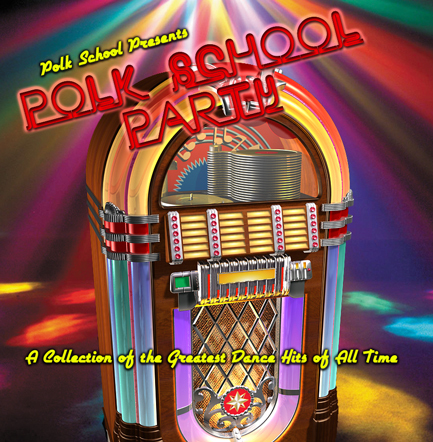 Speaking of Polk School, we finished our 3rd school CD this year, a 24 track collection of great songs entitled Polk School's Greatest Hits, which I produced, played, and wrote all the parts for. Recently, I have reconnected with an old childhood friend Todd Howard ("Todd-e-Bones" from "Last Forever") who I was in my first band with when I was 12 years old called High Adventure. He will be coming with us up to Maine tomorrow to help me co-write some brand new songs together, which may or may not yeild some new Cake tunes, but after 20 years, we may actually write our first CD of new music together. At any rate, you'll all be very glad to know that in January 2005, when a lot of the current craziness has slowed down, Sue & I plan to start up a brand new writing cycle for Spaghetti Cake, with an eye for a Summer recording session and a late Fall 2005 release of our 3rd Spaghetti Cake album! A long time to wait, maybe, but we'll do it, you'll see! Hopefully by next year's noodle news update, I will have some very exciting news about this to share with you! 1.21.2004 An afterschool songwriting workshop in Roxbury, CT. From the front page of The New Milford Spectrum. 2.14.2003 Valentine's Day again? Another year already? Seems like time for a Spaghetti Cake update. Our wedding was beautiful! Three days of friends, family, fun and most of all, music! Jo Horsley (bass: 'Jam Food','Sunflower') sang at our wedding, Colin Wilson from Glen's high school band Via Satellite sang, we had bagpipes at the ceremony, Adam Larrabee (guitar: 'Jam Food','Sunflower') and his band Bath Union Hope played Friday night for our rehearsal dinner, and then on Saturday The Reverend Tor Band played, and just about everybody sat in and jammed and it was awesome! We did not go to Alaska as we had hoped, but instead we went to both Nashville, TN and The Mayan Riviera in Mexico! Mexico was sunny, relaxing and maybe the first time in a long time that we actually did nothing at all. On the other hand, Nashvile was such an amazing town, it was hard not to 'work' just a little bit. After all, it's Music City U.S.A. Suz & I adored Nashville and dream often about packing up and moving there to be professional songwriters. I guess we'll see! In the meantime, we had a huge break right here at home. 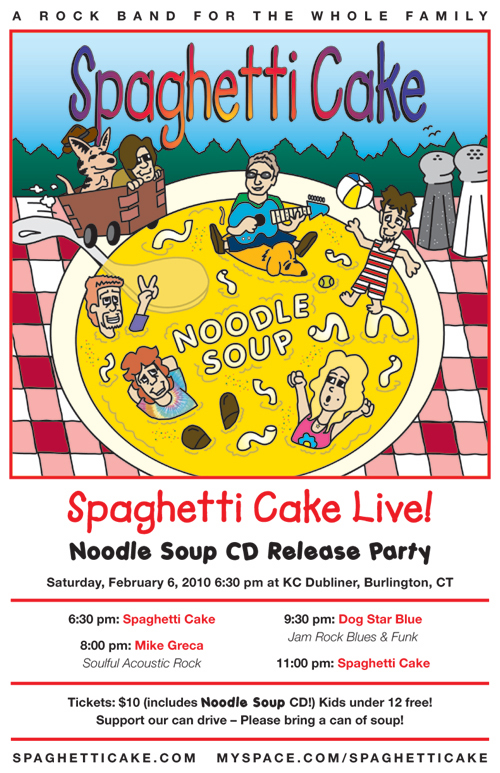 On New Year's Eve 2002, we discovered that Spaghetti Cake had been accepted into the Connecticut Commission For The Arts, which is an extremely well-known master teacher and artist roster in CT and will reap many exciting gigs for the band, not to mention a huge honor to be selected. The nomination puts in the likes of such artists as David Darling & The Paul Winter Consort. We continue to play with our friends Dennis, Rob, Mike & Joe from Dr. Juice and have had a run of great gigs recently in hometown Morris, Litchfield & Greenwich, CT! We love playing with those guys and look forward to every single note we play. Look for a lot more gigs in the months to come. In the meantime, we love all our noodles young and old and can't wait to see you guys again soon. 6.18.2002 Hello everyone, Glen & Sue here letting you know all things new & interesting in the world of noodles. Today is the usual day that I write to you before we head up to Blue Hill, ME to record our next album and this year is no exception! Indeed, Sue & I will embark for the cabin on Toddy Pond in the morning but alas, not to record album #3 but merely to relax and enjoy the first few weeks of our summer vacation. This school year was great for both of us but very very busy and we are looking forward to our time off. Sue will be finishing her Masters Degree while I will be putting the finishing touches on the brand-new Flipper Dave CD, 'Something Simple'. Our wedding day is Saturday, August 3rd 2002. The wedding will be at 2pm at St. Anthony's Church in Litchfield, CT and the reception will be at La Cupola Ristorante in Bantam, CT. All of our friends, family & loved ones will be there. For our honeymoon we will take a romantic cruise to Alaska, and our next news update to you will be sometime after that. 'Jam Food' continues to sell very well and 'Sunflower' is finding its way around the country as well. Sue & I have a few very interesting gigs coming up this summer (thankfully not too many,) most notably a hometown gig on the green in Morris, CT on August 22nd right after we return from our honeymoon! Check out our concert dates page for all the info. We continue to write new material all the time and are always working on bringing the music we love to a wider audience. Thank you for your continued love & support! 2.14.2002 Hello noodles! Happy Valentine's Day and because we love you, we thought you might like an update on what's been happening. Our 'Sunflower' CD release party was a major success, with as many kids this time as grown-ups! Our musical friends Dr. Juice, Monroe Mafia, and Flipper Dave were on hand to kick off the event, and we even ate spaghetti cake for dinner! It was so much fun. It's hard to believe the CD has been out for over 2 months already. Sue and I have been applying for more awards this year for 'Sunflower', so keep your fingers crossed! I was on our local radio station WZBG 97.3 talking about the album, as well as the 21-track CD I made with my students at Polk Elementary School. Sue went on a cool trip to Seattle, WA to learn more about computers, I've been recording a brand new studio CD with my adult-rock band Flipper Dave, and through the midst of it all we've been trying very hard to plan our upcoming wedding! In a few days we will perform at the CT Park & Recreation showcase concert, and hopefully we will be in your area of CT this summer! After so much great feedback from our fans in the past 2 years, we can't wait to be able to play the songs for you live! So stay tuned to this website and the concert dates link for where we'll be and when! 11.4.2001 It was one year ago today that 'Jam Food' was released at O'Hagan's Restaurant in Burlington CT and we are extremely pleased to announce that 'Sunflower' will enjoy its own release party once again at O'Hagan's on Friday December 7. It has been a long time since an update and much has happened. Sue and I are very proud to announce that our debut CD 'Jam Food' (now in its second printing!) was been honored the award of 'Best New Artist For Older Children' by the 2001 Children's Music Web Awards. We were thrilled to recieve the award and can not wait to unveil our new collection of songs to the world. Thanks to our family at I&B Technologies, both CDs are now ready to be ordered right here online at our secure server. Sue and I spent roughly from May through October working on the new CD 'Sunflower' and we could not be any happier with the results. Sue and I once again completed the art together while Sue finished the graphic design and layout. I was very happy to work once again with our old friend Mike Tierney at Sponge Forest Studio who did a marvelous job mastering the CD. Our old friend Earl Cohen did an incredible job mixing the record and we owe many thanks as well to Johnny BigRig and Owen 'Rico' Muir at Digital Dream for recording the music both here at home as well as in Maine. Sue and I have also been performing live in concert on a more frequent basis, which we hope to greatly increase in the coming months. Check out our new concerts link as often as you can! We will be building up a regular lineup of musicians to perform with us and we are setting our sights on a full live band as soon as possible. We hope to see you at a show soon! Finally, we have recieved so much wonderful feedback from our friends and fans in the past year or so and we really want to say a big thank you to all of you who allow us to do what we want to do and follow our dream. Much love!  Please join us on Friday December 7th at O'Hagan's Restaurant in Burlington CT for a very special night of music! 6.18.2001 Calling all noodles - The brand new CD is written! Sue and I (who just recently got engaged) are on the eve of embarking upon another amazing journey into the heart of Spaghetti Cake. Tomrrow we pack the entire show from CT straight up North seven hours to Blue Hill, Maine. This year we are pleased to announce we will once again be united with Jo Horsley on bass, Mike Tierney on drums, Adam Larrabee on guitar, and Johnny Platinum himself behind the console. Add to that this year, a technical crew to assist (our old friend Billy and our brand new friend Owen!) plus in-studio catering service coutesey of Adam's Dad! (Who conveniently happens to live five miles from the cabin! Whooda Thunkit?) We may even be treated to a surprise visit from our old friend Joe Hargraves! (see below) Want to know more about the album? There will be at least 11 new songs, perhaps a bonus track, and the working title for the CD (that means at this moment) is 'Sunflower'. A worthy title for this brand new collection of songs. I'd love to tell you all of the new titles, but we'll have to leave SOMETHING out for a surprise. 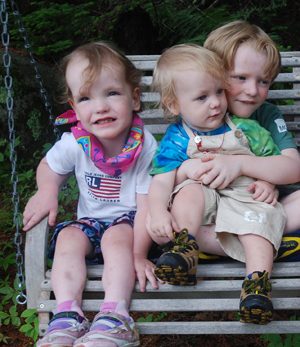 Await our next report after we return from Maine in two weeks! 4.26.2001 Yes, the new album is currently being penned and is talked about often on the telephone by Adam, Jo, Mike, Sue & myself. Lots of great things are happening these days. We're on WZBG 97.3 in Litchfield, you guys have got to call in for us and request your favorite Spaghetti Cake song, especially in the mornings between 4AM and 11AM. The phone number is (860) 567-3697. That's (860) 567-3697. Phone em up - Sue & I would love it!!! They're playing our tunes. The NY Times article will be out soon, we just don't know when yet, stay tuned. "Trampoline" will be featured in a movie coming out this summer called "The Energy Specialist". Glen and Bodhi were featured on Cable Channel 5 on a local news broadcast last Friday April 20th. (4:20) The music video for "Man In The Moon" is currently in the editing room and Joe & Glen are scratching their heads with a pencil and a razor blade contemplating the next move. (Probably another location shoot--anybody in???) Johhny BigRig and Glen just finished a complete album recording for a local singer/songwriter nemaed John Gahl from Litchfield CT. Mike Schuster from Buddha Funk Special(bass) and Scotty Allshouse(drums) from Max Creek were the session cats on the project and it swung like a bandit. Glen & Sue are working hard with school work and looking forward to the summer. And Glen's rock band Flipper Dave will be playing at The Wetlands in New York City next Wednesday night, May 2nd. VALENTINE'S DAY 2.14.2001 Hello Noodles everywhere! Wow, have Sue & I been busy and having fun lately. Our adult rock band Flipper Dave continues to work as busily as ever as Sue & I diligently write the songs for the second CD (the first brand new song is already finished! Called 'Give Me The Sun' it's great, you're going to love it!) and continue to work on the television commercial as well as the upcoming music video 'Man In The Moon'. Two talented local actresses Britney Johnson from Watertown and Jenna Temple from Washington have been cast to star alongside Sue. We begin filming in a few weeks and we're very excited about it. Watch for more on the video soon! Meantime Sue & I have been in the newspaper and on the radio and working very hard to tell as many people as we can about Spaghetti Cake. Thank you for being here! NEW YEAR'S DAY 1.1.2001 As we begin the new year there are many new things to be excited about. We have officially welcomed Joe Hargraves into the Noodle family as the director of our upcoming "Man In The Moon" music video! Joe is an accomplished videographer and we have already begun storyboarding this excitng MTV style video, as well as a television commercial for 'Jam Food'! As the schedule looks now, we will be seeing the finished version of the music video as early as April. In addition, Suz has begun writing the lyrics to our follow-up album, which we hope to have completed demos for in March. All the members of Spaghetti Cake are looking forward to heading back up to Toddy Pond in June to make musical magic all over again! We'll keep you posted as the new record progresses. Finally, watch for the "Making The Band" TV show featuring the boys of 'O-Town'. Our own Johnny BigRig recorded the band's upcoming smash single. Way to go, Johnny! 12.10.00 Happy Holidays from Spaghetti Cake! Tomorrow will be the premiere performance of the music from "Jam Food" at Shepaug High School in Washington Depot CT. Featuring the choral arrangements of Christopher Shea and members of Buddha Funk Special. Admission is free, showtime is at 7PM. This performance is being recorded by John Roper's Digital Dream and will be available soon to download on this site! In other news, "Jam Food" is selling well and is available at several area locations as well as right here on our website. We hope you are enjoying the music and as always, sign up on the Noodle Bowl e-mailing list! 11.7.00 Our CD release party at O'Hagan's Restaurant was a huge success! Thank you to all of our friends & family who celebrated with us, especially our good friends in Buddha Funk Special, Liberty Bus & The Joe DeVeau Band. "Jam Food" is available right here and right now on our secure server for only $15. Order now! 10.7.00 'Jam Food' is officially in the can. Our CD release party is scheduled for Saturday November 4th at O'Hagan's Restaurant in Burlington CT. Complete details on front page of website. Throw your email addy into the noodle bowl right away so we can send you a formal invitation! FALL 9.22.00 Just a quick news update for our bowl of noodles out there... the CD is finished being mixed. John & Earl worked tirelessly around the clock before Labor Day to finish the original 10 mixes recorded in Blue Hill. An additional track has been in the works as well, recorded this summer at Sponge Forest Studios. And another funny thing happened on the way to the CD release party - School opened! Whoa! Oh well, back to work at a new school for me and back to the books for Suz too. But fear not! We're recovered and ready to send "Jam Food " out to be printed. So in a few weeks we'll be sending out the invitations. Hope you'll join us and join in on the party - We're just getting started! 8.8.00 Just a quick news update for anyone anxiously anticipating the release of "Jam Food". The good news is we have welcomed Earl "Mutt" Cohen into our little family, a mixer and producer from NYC whose resume of fantastic artists that he has worked with is longer than Johnny's wig. So what was originally meant to be 5 days of mixing looks like it will be 5 weeks instead. Hey, no big deal when you're after perfection. Also the mighty Rob Fried from Max Creek finished his percussion parts some time ago and they sound great. Sue and I could not be happier about the way the mixes have been turning out. (As of this writing, we are about halfway through the album) The few people who have snuck a peak have little to say after hearing the music, so we take that as a good sign. When will you hear it? Sue and I have set an album release party date for Sat. September 23rd at our home in Morris CT, and we should have the CDs printed and available a week or so prior to that. So hang in tight, 'cause it's coming! We love ya. Sign up on our guest list and we'll notify you when the album comes out! 6.29.00 We have safely and happily returned from Maine on schedule with a finished album in hand and it sounds amazing. We spent a week on Toddy Pond in Blue Hill surrounded by great energy, incredible music and way too much delicious food thanks to our resident gourmet cook Sue and even Adam's Dad! Sue and I want to thank everyone who initially gave us so much support on the project, all those who had a hand in getting the entire show up to Maine for a week, and of course the talented musicians who brought it to life. We now switch our creative hats to the graphic design and artistic layout of the CD itself as Johnny BigRig delves into the final overdubs with Rob Fried and the mixing process. If the fates continue to smile, we should have the finished version of the CD prepared and ready for you to spin by the beginning of August. 6.15.00 Here's what's cookin'. Months ago Sue and I, who are both schoolteachers, wrote a bunch of lyrics and music and decided to try to record it with some friends of ours. "The Yam Demos" were born and thus was our project 'Spaghetti Cake'. Quickly I assembled a band, namely musicians I have admired for much of my life but have never had the chance to record with. So now months later we're off to Maine for the last 2 weeks of June and we'll be in beautiful Blue Hill, just north of Bar Harbor making music by the lakeside. We'll have it mixed and ready to go by the end of July and hopefully available everywhere soon. Our music will move not only its intended audience (mature children) but their parents as well and fans of great improvisational music (aka 'jamming') everywhere.